We’re big fans of wool shawls in the Fall – such versatile pieces keep you warm and comfortable, and are great accents for all types of layered wardrobe combinations. 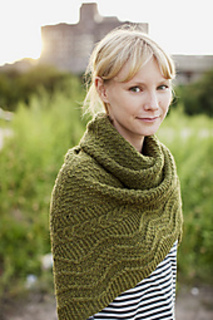 This triangular shawl is a texture-lover’s dream. 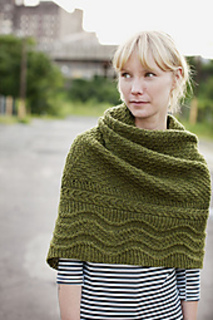 The border features garter stitch, meandering cables, and short-row detailing. The main body fabric is worked in a lovely variation on Moss Stitch which creates balance for the more heavily patterned border. We hope Ashby keeps you warm this Fall and Winter! 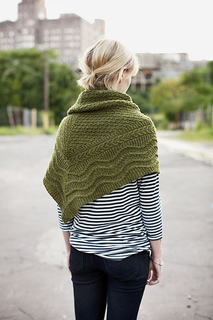 The horseshoe cable on the border section of this shawl reverses direction after the central corner turn; the cable twists on the second half of the border move “outward” rather than inward as given for the first half of the border. Please refer to the border charts for details.